Join Jeffery Renard Allen, Quincy Troupe, and Lawrence Schiller for a reading and signing in celebration of The Norman Mailer Center On the Road fellowship and workshop program. Allen's new novel, Song of the Shank is a contemporary American masterpiece about music, race, an unforgettable man, and an unreal America during the Civil War era. Coined with the French word errance (to wander) in mind, Troupe's latest collection of poetry, ErranCities, roves through ancient Yoruba to the streets of Harlem to the tropical heat of Guadeloupe and emerges with a new vocabulary for the transformations of the physical, philosophical, and musical worlds. In honor of Norman Mailer and Salt Lake City, Lawrence Shiller will read selections from The Executioner's Song. Places in the signing line are reserved for those who purchase a copy of the featured book from The King's English. GET YOUR COPY NOW! Preorder your signed copy of the featured book today, by either calling the store at 801-484-9100 or ordering online. Please specify if you will be attending the event and if you want your book personalized. This event is sponsored by the Norman Mailer Center. 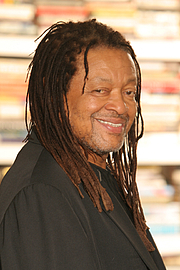 Quincy Troupe is currently considered a "single author." If one or more works are by a distinct, homonymous authors, go ahead and split the author. Quincy Troupe is composed of 1 name.